Pinocchio makes his debut appearance in the Disney by Britto brand accompanied by Jiminy Cricket, Pinocchio's conscience and best friend. 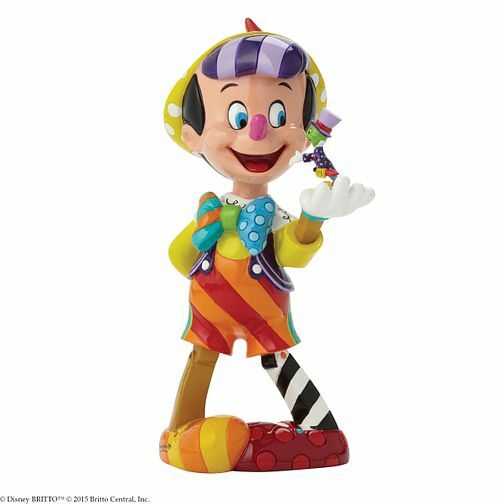 This figurine celebrates the 75th anniversary of the Disney classic Pinocchio. Designed by international pop artist phenomenon Romero Britto, an artist whose paintings and sculptures are currently exhibited in more than 100 galleries worldwide. "An art that is too important not to share", says Britto. "One that elevates the soul and nourishes the heart". The figurine is made from resin. Unique variations should be expected as this product is hand painted. Packed in a branded gift box.